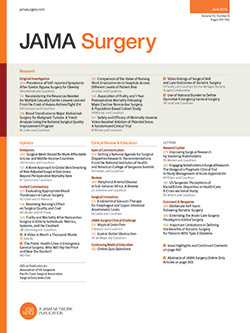 Objectives: To identify knowledge levels of academic surgeons about Food and Drug Administration (FDA) and Institutional Review Board (IRB) regulations for clinical research and to determine whether being a member in an IRB, conducting or participating in clinical trials, or being a member in surgical societies affected knowledge levels. Design: Survey of surgical department faculty members in 20 universities. Results: Sixty-five responses were received from 14 sites. Overall mean (±SEM) correct score was 6.7±0.2 of a possible 20 points. The best predictor of overall score was being a primary investigator of a clinical trial (P<.001), followed by being or having been a member of an IRB (P≤.02). The total mean score of members of the Surgical Infection Society (8.2±0.5) was significantly higher (P<.001) than that of nonmembers (6.1±0.2), a phenomenon not observed with other surgical societies. In certain hypothetical clinical scenarios, all respondents were mistakenly willing to conduct clinical trials without obtaining appropriate approval from the FDA. Four (22%) of 18 IRB member respondents and 16 (25%) of the 65 respondents were willing to conduct human research without appropriate approval from patients, the IRB, or both.